Gian-Carlo Rota was one of the most original and colourful mathematicians of the 20th century. His work on the foundations of combinatorics focused on the algebraic structures that lie behind diverse combinatorial areas, and created a new area of algebraic combinatorics. Written by two of his former students, this book is based on notes from his influential graduate courses and on face-to-face discussions. Topics include sets and valuations, partially ordered sets, distributive lattices, partitions and entropy, matching theory, free matrices, doubly stochastic matrices, Moebius functions, chains and antichains, Sperner theory, commuting equivalence relations and linear lattices, modular and geometric lattices, valuation rings, generating functions, umbral calculus, symmetric functions, Baxter algebras, unimodality of sequences, and location of zeros of polynomials. Many exercises and research problems are included, and unexplored areas of possible research are discussed. A must-have for all students and researchers in combinatorics and related areas. 1. Sets, functions, and relations; 2. Matching theory; 3. Partially ordered sets and lattices; 4. Generating functions and the umbral calculus; 5. Symmetric functions and Baxter algebras; 6. Determinants, matrices, and polynomials; 7. Selected solutions. 'All in all ... 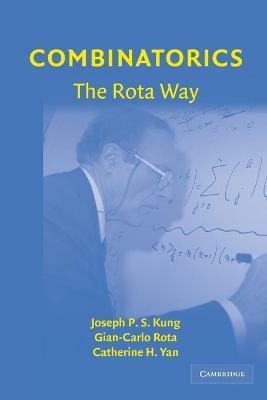 I find Combinatorics: The Rota Way simply too good to pass up. Would that every day had 48 hours...' MAA Reviews '... each of its chapters can be considered as a single expository work, conceived by Rota and masterfully moulded and improved by Kung and Yan.' Mathematical Reviews "...simply too good to pass up." Michael Berg, MAA Reviews "...stimulating, valuable book..."
D.V. Chopra, Choice Magazine "Students and researchers of combinatorics, as well as logicians and computer scientists, should keep a copy on their bookshelves." Walter Carnielli, reviews.com "A mathematician or computer scientist wanting to learn more about the science of combinatorics will find a good read here. The content is well written, very accurate and well edited." John Mount, SIGACT News "This book represents a valuable contribution to combinatorics in general, and I think that it could be useful to all researchers dealing with matters of this kind, especially younger ones, who intend to spend much of their future efforts on problems of a combinatorial nature." Dr Joseph P. S. Kung is Professor of Mathematics at the University of North Texas. He is currently an editor-in-chief for the journal Advances in Applied Mathematics. Gian-Carlo Rota (1932-1999) was a Professor of Applied Mathematics and Natural Philosophy at the Massachusetts Institute of Technology. He was a member of the National Academy of Science. He was awarded the 1988 Steele Prize of the American Mathematical Society for his 1964 paper 'On the Foundations of Combinatorial Theory I. Theory of Moebius Functions.' He was the founding editor of the Journal of Combinatorial Theory. Catherine H. Yan is a Professor of Mathematics at Texas A & M University. She was a Courant Instructor at New York University (1997-1999) and a Sloan Fellow (2001-2003).